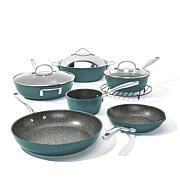 Curtis delivers again with this incredibly versatile cookware set. 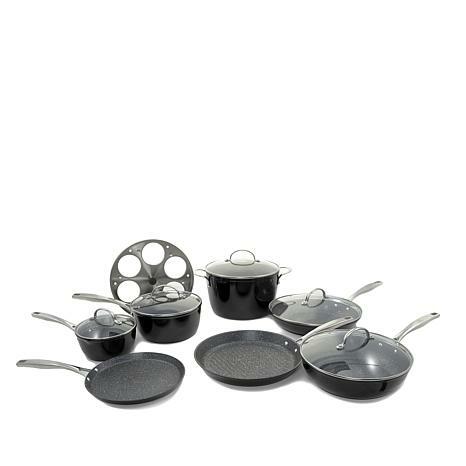 From its various saucepans to the workhorse of a stockpot, it comes with all the essentials — plus several unique extras like the crepe pan and egg poacher set. 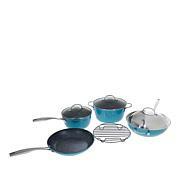 The interiors are coated in his amazing, metal utensil-safe Dura-Pan nonstick that makes cooking and cleanup so easy, you'll wonder how you ever lived without it. Curtis has you covered! 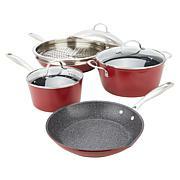 These pans work and are non-stick just as Curtis stone said they would. I have several of his pans and bakeware and they are my favorite. Love these pots! 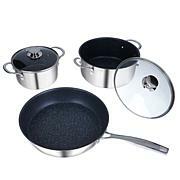 They dont stick and easy to wash. Light weight and cooks great. I have never bought a set of pans that even come close to Curtis'. I will never buy any other pans. And accessories. Great Pans! Light weight - easyClean up. Just love the egg poachingPan it is the best. I use it everyday.This set of pans are just great.